14 November 2014, at 10:27a.m. CZECH REPUBLIC - Vetrimoxin LA administered to suckling piglets 24 hours after birth decreased significantly the mortality in the pre-weaning period from almost 15 per cent to 9.7 per cent, according to R. Krejci and A. Lopex of Ceva in France and J. Malasek, a veterinary consultant in the Czech Republic. Suckling piglets are exposed to infections within first hours of life. The first contamination with Streptococcus suis can occur already during parturition. The clinical signs of S. suis infection develop mostly at the age of 10 to 21 days but in some occasions even earlier, particularly in males due to previous castration. Prophylactic use of efficient antibiotics can reduce the incidence of the disease and decrease the losses due to mortality or crushing of weak, sick piglets. The aim of this study was to evaluate the efficacy of prophylactic treatment with Vetrimoxin® LA (amoxicillin inj., Ceva) in the in the farms with endemic S. suis infections in suckling piglets. Sows were randomly assigned into two treatment groups according to their parity. Piglets of the group 1 (G1) were treated within the first 24 hours after parturition with 0.5ml Vetrimoxin LA. Non-treated piglets of the second group (G2) served as the control. In total, 372 piglets were included in the G1 and 327 piglets in the G2. All piglets were weighed at one day and 18 days of life and mortality was recorded daily per pen. The majority of deaths occurred within first three days of life. Vetrimoxin LA-treated piglets had lower mortality particularly on days 3 and 4 of age (Figure 1). There was no difference in the calculated average daily gain. 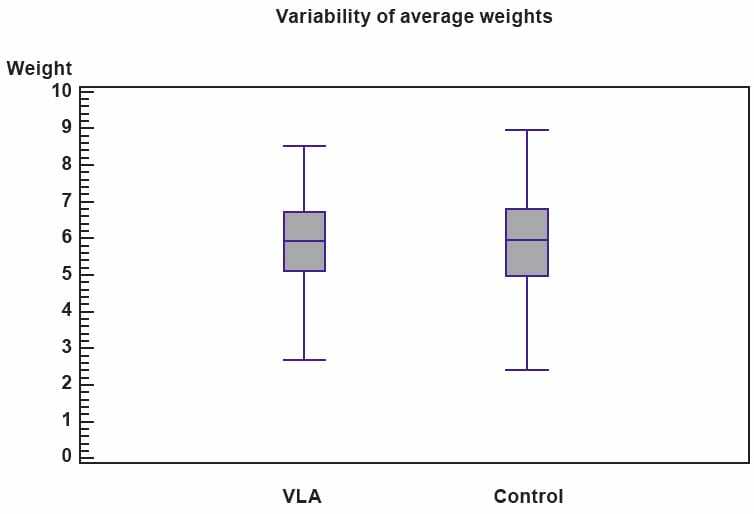 The weight variation was lower in the Vetrimoxin LA group, even if the difference was not statistically significant (Figure 3). Vetrimoxin LA administered to suckling piglets 24 hours after birth decreased significantly the mortality in the pre-weaning period from almost 15 per cent to 9.7 per cent. The cumulative mortality includes the sudden deaths, crushing and deaths after the acute disease. Early prophylactic treatment decreased the mortality due to the infection itself and in addition to that, healthy and more vital piglets might have had better chance to evade crushing. The average weight gain was not improved in the treated group, which indicates that the growth rate was not severely affected by those infections which were controlled by amoxicillin. Amass S.F. et al., 1996; Swine Health and Production, 269-272. This paper was presented at ESPHM 2014. Find out more information on streptococcal infections by clicking here.